Lazy sunday afternoon's.......after a nap I always crave to eat something crunchy,fried and spicy. I don't mind going to the extent of putting some efforts to satiate my craving. This sunday it was a job which was easy and satisfying to the taste buds. 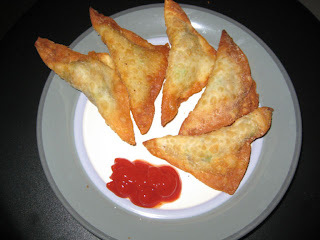 I made samosa's using the wonton wraps. It took me close to half hour to prepare the samosa's ..but to wash it down it just took couple of minutes!!! yup! they were that tasty. Cook potatoes and mash them with green peas. Add garam masala,cumin,coriander and chilli powder.Add salt to taste. Take one wonton wrap and place it on your palm. Take a spoon and scoop the filling in the center of the wrap.Brush the opposite corner's with oil .Press it against each other so that it sticks together. Repeat the same with the rest of the wraps. Heat oil in a frying pan and deep fry the samosa's untill golden brown. Serve it with kethchup and savour it with a hot cuppa coffee or tea! love samosas. very nice party snack too..